Taking the time to properly label the pipes in your facility may seem like wasted effort, but in reality it is very important. Pipes are typically used to bring a wide range of different fluids (or even gasses) to different areas throughout the facility. While the markings might not be too important when everything is operating normally, they are an essential safety feature when things go wrong. For example, if a pipe is leaking, it is critical to be able to quickly see what it is that is in the pipe so safety teams can respond properly. Even when someone is opening a faucet or other opening on a pipe, it is good to be able to be 100% sure they know what will be coming out. With that in mind, look over the following five common pipe marking mistakes, and make sure you take precautions to avoid making them in your facility. One of the most common mistakes that people make is having the pipe markings spaced out further than they should be. This is often because it is difficult to get access to the pipes, so they only place the labels on the easiest spots to reach. Unfortunately, this will leave your facility exposed to some significant risks, including having any emergency response teams be unable to tell what is in the pipe. For this reason, it is important to have labels placed a maximum of every 50 feet. Ideally, having them closer is always better, especially when there are obstructions that can make it difficult to see the labels. Even if you do have the labels put at least every 50 feet, that isn’t always enough. There are several key locations that always need to have labels on them in order to ensure people can see them at all times. The following are spots that need labels, even if they are far less than 50 feet from each other. Start & End – You must have pipe markings placed at the beginning and end of each pipe to ensure they are easy to see. Going Through Walls – When a pipe passes through a wall or any other object that can’t be seen through, a label should be placed on both sides of the obstruction. Change of Direction – Any time a pipe turns, there should be a pipe marking in place on both sides. Valves or Flanges – Any time there is a valve or flange on the pipe, a label should be present too. This will help make it easy to see from any side of the piping. When putting the labels on the pipes, it is essential to have them positioned properly so that they are easy to read. In some cases, people will put them too far to one side, for example, which makes it useless from the other direction. If the pipe markings are put in place before a new pipe is put up, it is even possible for the label to be facing up, where it does almost no good at all. The best practice is to have the label positioned so that it can be read easily from any direction. If necessary, use multiple pipe labels to ensure the label is readable. Depending on what is being transported in a given pipe, there are not always set requirements for what the label has to say. When this is the case, some people are tempted to just use generic labels that identify the pipe as hot, cold or containing a hazardous material. 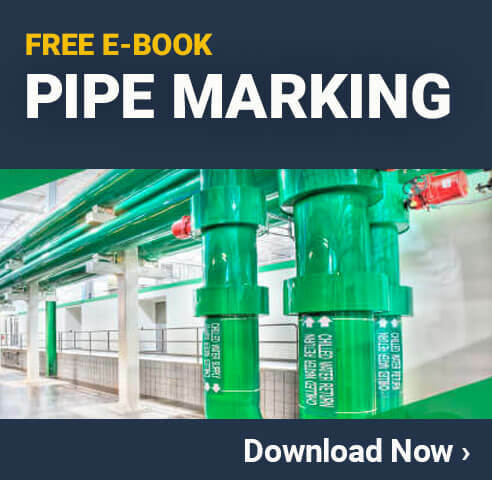 Even if OSHA or other regulatory agencies don’t specify what needs to be on the pipe marking, it is still a good idea to be as specific as possible. The best way to do this is to use an industrial label maker (like this one), which can print off custom labels in just seconds. When doing this, make sure to use high quality pipe label stock, such as vinyl labels (which you can find here), to help ensure they will look great, be easy to read and last a long time. One of the most important things that need to be on any pipe marking is an indicator of what direction the solution in the pipe is flowing. This can be something as simple as an arrow on the pipe marking, as long as it is pointed in the right direction. These direction identifiers can be extremely important during an emergency as it will allow safety professionals to track the pipe back to its source much faster and easier. It will also help make it easier to identify which faucets and other openings will have pressure on them so people know when they need to take the proper precautions. The bottom line here is that you need to make sure that the pipe marking process is seen as a facility safety issue. It isn’t simply a good idea or even a regulatory obligation. Taking the time to use the proper pipe markings in the proper locations will help ensure your facility is as safe as possible. The fact that pipe labels are so affordable is just one more reason that all facilities should take the time to ensure they purchase them and have them properly installed on all the pipes throughout the facility.